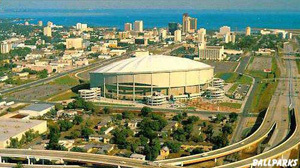 Fans loved the new -- but temporary -- ThunderDome (Tropicana Field for the Tampa Devil Rays) in St. Petersburg, which was renamed from the Suncoast Dome when the Lightning moved in. Built for baseball, the building was modified to include an air-conditioning system for the ice and a $1.5 million, eight-sided Supervideo screen. Attendance in the Lightning's first year at the Dome averaged over 21,000, including 27,227 in the home opener, an NHL record. The team's permanent arena, The Ice Palace, will have more than 20,000 seats. If the team's fortune continues its steady climb, there is little doubt those seats will be filled too.